Bateshwar is located on the east of Agra on the west bank Yamuna at a distance of 70 km. the abode of Lord Shiva, Raja Badan Singh of Bhadawar built here the first temple of Bateshwarnath in 1646. Soon after, Diwan Bakht Singh, and the Nikunja Bihari Temple by the Raja of Bhabawar built the temple of Thakur Bihari. 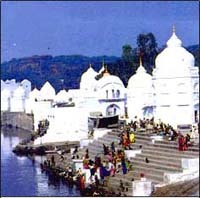 There are numerous ghats to be seen along with numerous white-painted temples. Other must sees include mural paintings at some of the temples, and the annual fair of October attracting thousands, is said to be the largest ‘Cattle Fair’ of the state. This entry was posted in Bateshwar, Uttar Pradesh. Bookmark the permalink.